This recipe is from Rachael Ray's Look & Cook cookbook. I made this last weekend for my whole family and it was a big hit. I try to give my little guy fish once or twice a week because of all the amazing nutrients that are found in fish. Fish are considered a complete protein, as they contain all 9 amino acids. They are also filled with Omega3s which are essential for our little ones. 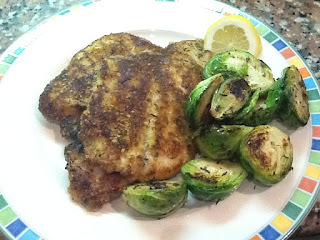 I used petrale sole for this recipe. Petrale sole has an extremely low amount of mercury, which makes it safe to feed to your little one. This is for little ones 10+ months who are ready for finger food. I served this with sauteed Brussels sprouts, but you can serve it with any veggie you like. Set up three dishes for breading the fillets. In the first combine the flour with a little salt and pepper. In the second, beat the eggs with a splash of water. In the third, combine the bread crumbs, 1/2 cup parmesan cheese, thyme, and the grated zest of one lemon. Dip the fillets in the flour, then in the egg, and finally in the bread crumb mixture. Heat a large skillet over medium to medium high heat with 2 tblsp olive oil. Saute fillets 2 at a time for 3 minutes on each side (only turn once). Add 2 more tbslp of oil to the skillet and repeat the previous with the last 2 fillets. When fish is cooked squeeze lemon over each fillet and serve. 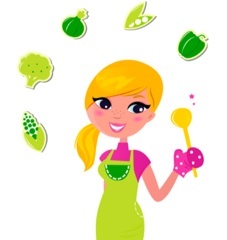 Serving size for your little one is 3 oz or 1/2 a fillet. Make sure to cut your little one's portion up into bite size pieces. Enjoy!